Although summer season (June-August) does have more bird species, there are some winter specialties that are well worth seeing in this area of northern Japan. February is probably the best single month for winter birding, the conditions are just right for most of the species to be seen, and towards the end of the winter lasting from December to February the light is strong and bright. The entire trip went flawlessly: Hokkaido is not heavily populated, the roads are good, and enough English is spoken so that visitors can manage. We visited four main spots, each with their unique features. Rausu is a small coastal fishing town, population just over 6,200. It’s the most northeasterly town in Japan, and the gateway to the rugged Shiretoko Peninsula. 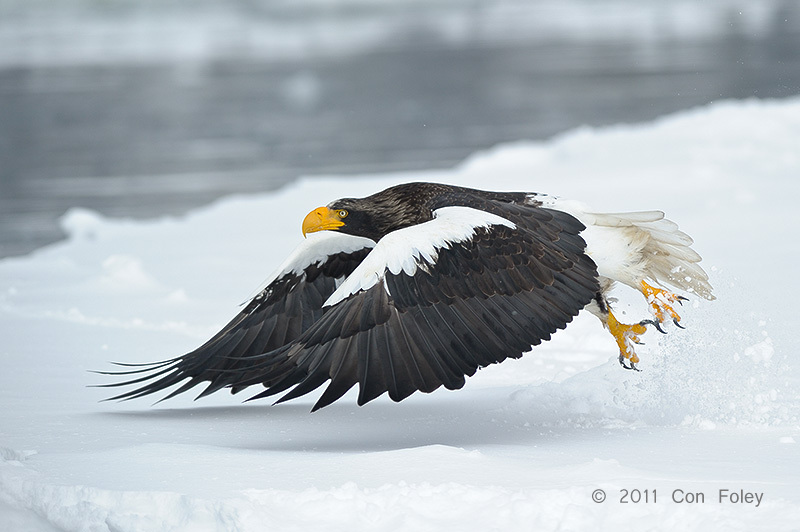 In winter large concentrations of Steller’s Sea Eagles and White-tailed Sea Eagles hunt for fish on the pack ice, which drifts down from the Sea of Okhotsk. Nature tour boats from Rausu harbor are the best way to see these birds. We stayed for three nights in a small minshuku (Japanese style bed & breakfast) famous for nightly visits of the Blakeston’s Fish Owl. The food was out of this world, Hokkaido crabs, sweet and delicious. The Steller’s Sea Eagle Haliaeetus pelagicus is the heaviest eagle in the world. It breeds in northeastern Russia and winters further south, reaching Hokkaido where it spends its days hunting for fish around the pack ice. Dozens of birds gather in Rausu harbor for the free meals provided by the tour boats. 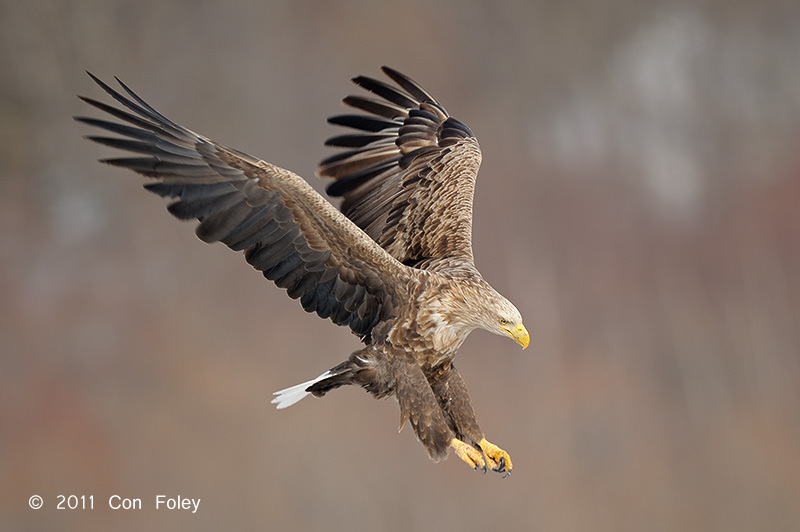 The White-tailed Sea Eagle Haliaeetus albicilla is another large eagle, closely related to the Bald Eagle Haliaeetus leucocephalus of North America. It is more widespread than Steller’s and breeds across northern Europe and Asia, and is a year round resident of Hokkaido. The Blakiston’s Fish Owl Bubo blakistoni is one of the largest owls in the world. 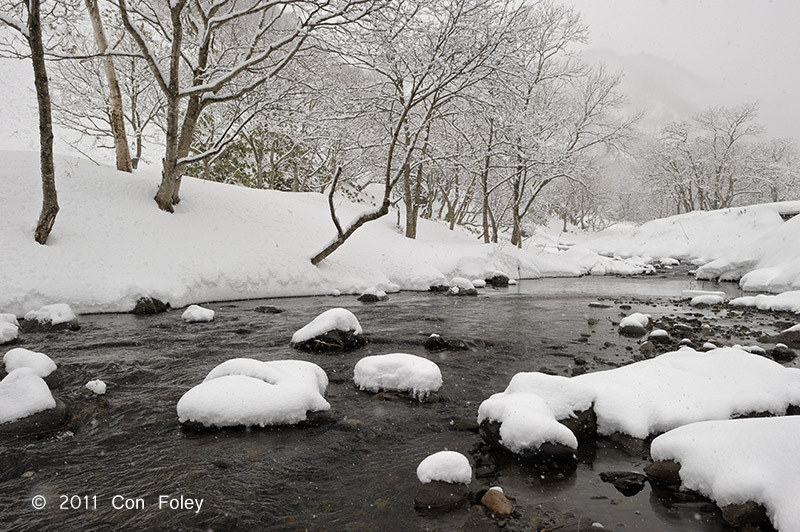 It is endemic to northeast Asia and needs good forests near a fast flowing stream that does not freeze in the winter. 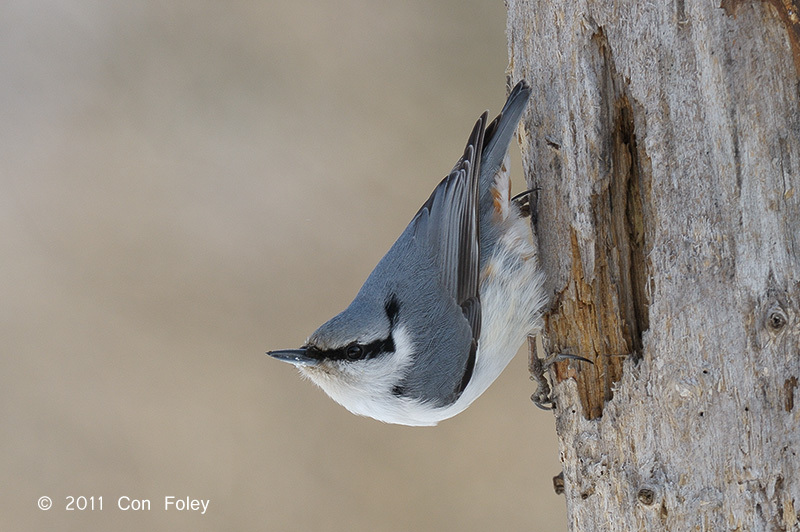 It is globally endangered with perhaps 20 breeding pairs left in Hokkaido. The individual pictured is part of a family that has it considerably easier than most: they were being fed small trout daily near this stream at Rausu. Nemuro is a larger coastal town, population just over 30,000. We stayed four nights outside of town in a minshuku run by a very knowledgeable birder and his wife. There is lots to explore, many fishing harbors, several lakes, the most easterly cape in Japan, and the largest herd of Sitka Deer. Our inn had a wonderful bird feeder which attracted many species of birds. 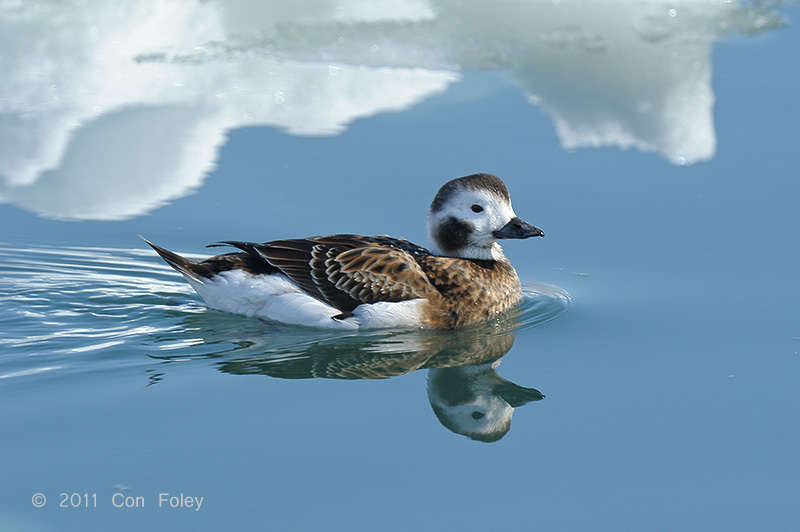 The harbors of Hokkaido have less pack ice and are calmer than the open oceans, so the are a good spot for watching many species of migratory ducks such as this pair of Long-tailed Ducks Changula hyemalis. The male has the elongated tail. and the Great Spotted Woodpecker Dendrocopos major. Lake Kussharo is the largest volcano crater lake in Japan, and although it freezes over, the water is warm to the touch. There is a large wintering flock of Whooper Swans. The swans concentrate around the edges of the lake where the water usually is not frozen. Inn owners feed the swans oats; by February they will be beginning their mating rituals. We spent one full morning with the swans. 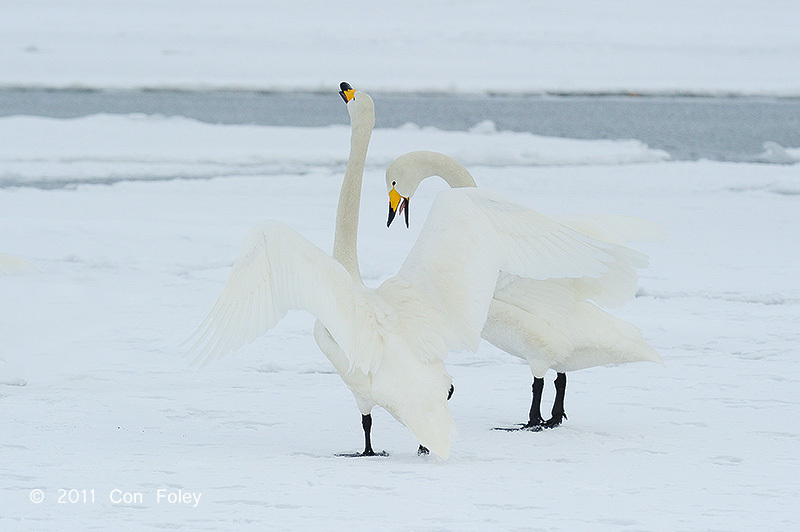 The Whooper Swan Cygnus cygnus breeds throughout northern Europe and Asia and winters further south with a sizable wintering population in Hokkaido, most notably at Lake Kussharo. Since the water is warmer than the air it creates a misty effect. This pair of swans has started an early spring mating display. Tsurui is a small village of around 3,000 people. Hokkaido is home to a resident population of the endangered Red-crowned Crane, and the cranes live mainly in the marshes around this village. Red-crowned Crane watching is clearly one of the pillars of Tsurui’s economy. There were several hundred tourists scattered around a half dozen prime viewing sites watching the cranes. In the winter the crane’s natural diet is supplemented with cracked corn, and at the Akan International Crane Center they also provide fish. We spent two nights in Tsurui at a modern inn run by a well known photographer. The Red-crowned Crane Grus japonensis is probably the most iconic bird in Japan. 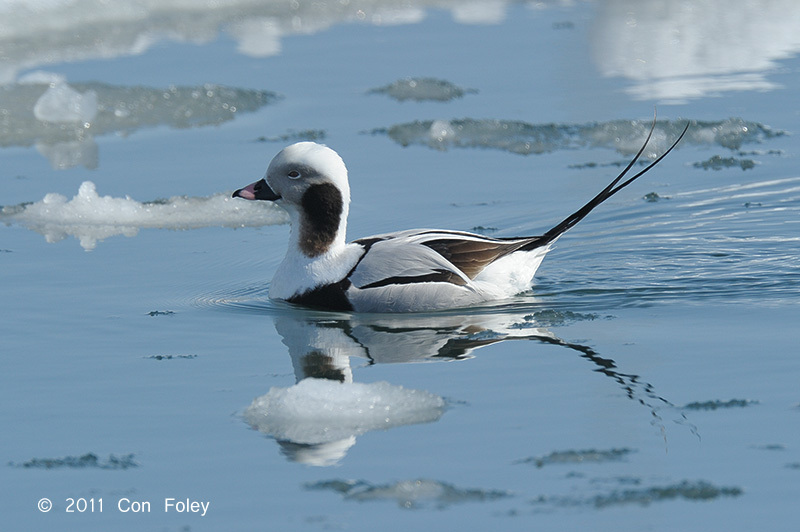 Globally endangered, the resident population in Hokkaido has been nutured over the years and has now reached a stable population of arund 1,000 birds. In February they begin their elaborate mating display. Every day at 2 pm staff from the Akan International Crane Center put out fish for the cranes which attracts the White-tailed Sea Eagle who try to steal the fish, not without some resistance from the cranes. This spectable also attracts about one hundred photographers! We departed for Singapore from Kushiro airport. Our ten days, nine nights trip was just the right duration for a group of photographers, birders could do the trip in perhaps half the time. Altogether the trip was very enjoyable; and especially after the triple disasters in Japan this year, one of the best things we can do to help our Japanese friends is to go and spend our tourist dollars there. i’m going to hokkaido tomorrow for my master’s dissertation (i’m studying biological photography & imaging) and i plan on seeing the daisetsuzan, shiretoko and akan national parks. I’d really love to get a shot of a blakiston’s fish owl in the wild, so your post about the minshuku that receives nightly visits really attracted my attention. I understand that i’ll be going in a different season but any chance you remember where this minshuku was/what it was called? Hi, I am a Singaporean, very interested to see the stellar sea eagle, could you provide me some details or contact of that place you visited? Thanks. I’m in Hokkaido now and keep seeing the little birds outside my window. Was wondering what they were and found this very nice blog! Thanks for creating and sharing! Just came across your Hokkaido article with your fantastic pictures.Our youngest so(the pro-golfer) is marrying a Japanese girl in Hokkaido in February and we will attend.Although your article will help tremendously re towns and accom,has anything changed since you were there.PM please if so. Great photo’s! 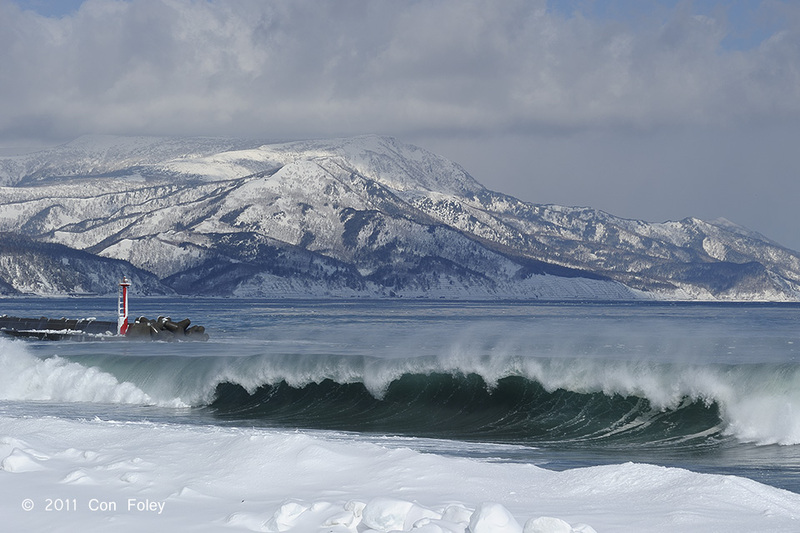 We have just booked a trip to Japan…any suggestions for great photography spots in Hokkaido end April? Hi Yvonne, sorry I really don’t know anything about Hokkaido at end April. I imagine it will be very different. 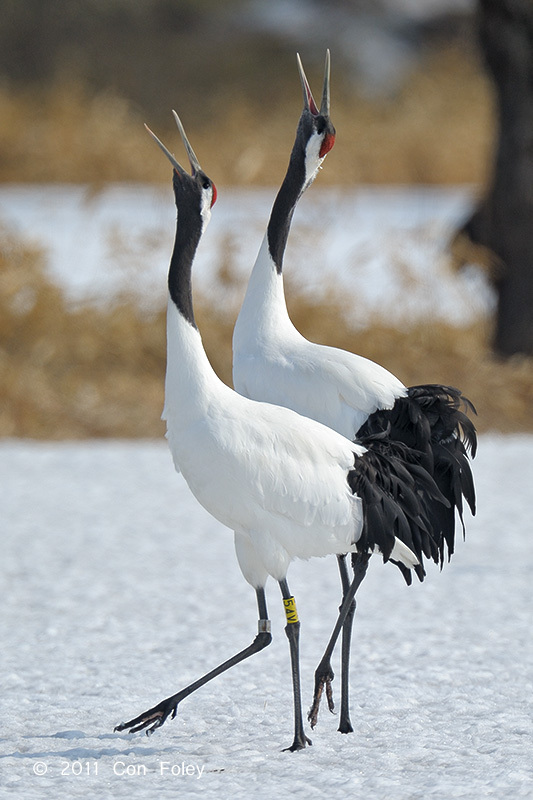 The snow will likely be mostly gone and the Red-crowned Cranes may have moved away from the feeding stations to their breeding grounds. The pack ice will be gone so the Stellar’s Sea Eagles will have gone back North. I guess the swans will have migrated to. For sure the Blakiston’s Fish Owl will still be there, so that’s one possibility. You took the most stunning pictures. Thank you for sharing. Have you considered leading a tour or organizing a tour so other wildlife photographers can go with you? I would love that. Thanks. I’ll be happy to lead a tour. Will be in contact. Hi could you give us details of any guided tours to hokkaido, thanks. Great pictures and excellent to hear about your trip. You mentioned self drive, how did it go driving there in winter, especially to the places you went on the eastern side? We rented a AWD vehicle, which I’d recommend for winter driving. We were lucky, there was not too much snow or ice on the roads. Japan maintains the roads very well. However, of course there could have been a major winter storm. We’re planning a trip there in February. Just want to check if the minshuku you recommended in the three places have non-smoking rooms. We’re both asthmatics. Thanks! The one in Rausu permits smoking, the other two I think will have non-smoking rooms. Guess we miss the owl. 🙁 Do you know anywhere non-smoking in Rausu? We can’t seem to find any that are. The owl is really one of the major highlights of the trip, you should make every effort to see the owl. Sorry, I don’t know about accommodation there, but I think the big tour groups stay in hotels that are reasonably close by. Keep searching. In about three weeks I’m going to Hokkaido. 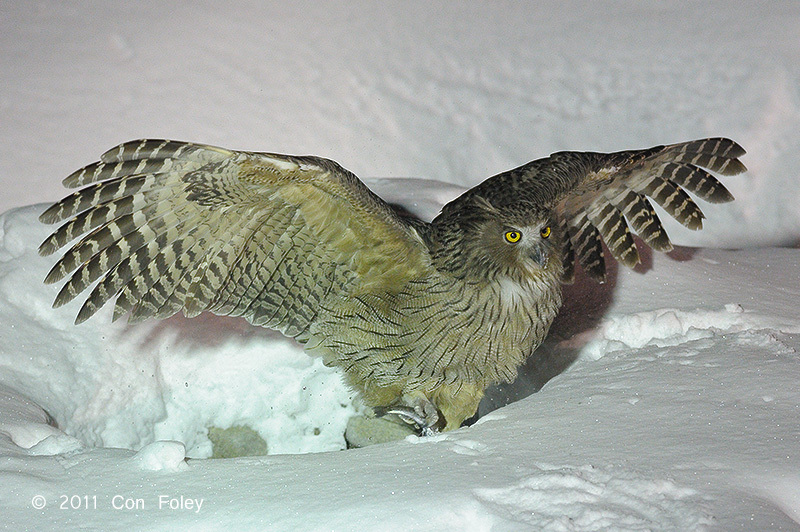 For the Blakiston Fish Owl I’m staying in Dai-ichi Rayudo. It is a ryokan with an onsite Onsen. Some English spoken. Contact +81 153 782132. Regards, Ed, from the Netherlands. Thank you for the detailed report. I do have some questions regarding the eagles at Rausu. How many boats do the eagle tours? Is it a mixture of small (private charter) and large (tour groups) or is it mainly just the large boats? Do you have any boats/captains you’d recommend or contact information for any? Are you able to just show up in Rausu and book one or should these reservations be made in advance? Thanks! There are just a couple of boat operators. Your lodging accommodations (hotel, or home stay) can call and make reservations for you the day before when you want to go. Very easy. The boats take about 20 to 30 people max. These are dedicated eagle tour boats. In other words, they carry blocks of frozen fish which they put out onto the ice for the eagles to feed on. Hi, having read your article and seen those wonderful pics, me and my wife are finally going in Feb!! I’m trying to follow your footsteps …literary :)…can you advise focal lens to bring? I have D500 with 500mm prime but not sure if it is too long? Also any advise on good spot for photography will be great. Thanks in advance!! Your combo is not too long, bring it; but also bring something shorter. When I went I brought a 600mm and a 300mm. Have a great trip ! I will be in Hokkaido on 10th March through 13th March. I intend to cover the Swans; Red Cranes; and Stellars Eagle. Could you please help me with a B&B at Rausu. Also, more importantly, what will the weather be like during these days. Thanks much for your help! Thank you for your feedback. I had a splendid trip in Hokkaido. Although short, it was very productive. I spotted the sea eagle (both stellar and white-tailed); four different fox by the roadside in Notsuke Peninsula; Whooper swans at Lake Kusharo; Snow Monkeys at Jigokudani; I missed taking the morning cruise for the sea eagle; Had I known about the morning cruise, I would have surely booked one. I had booked the noon cruise. They took us to the spot where plenty of eagles congregate in search of fish; Had an amazing photographic tour, overall. Thank you for your blog, which made it easy. I will be in Hokkaido in 2nd half of Dec 2018. 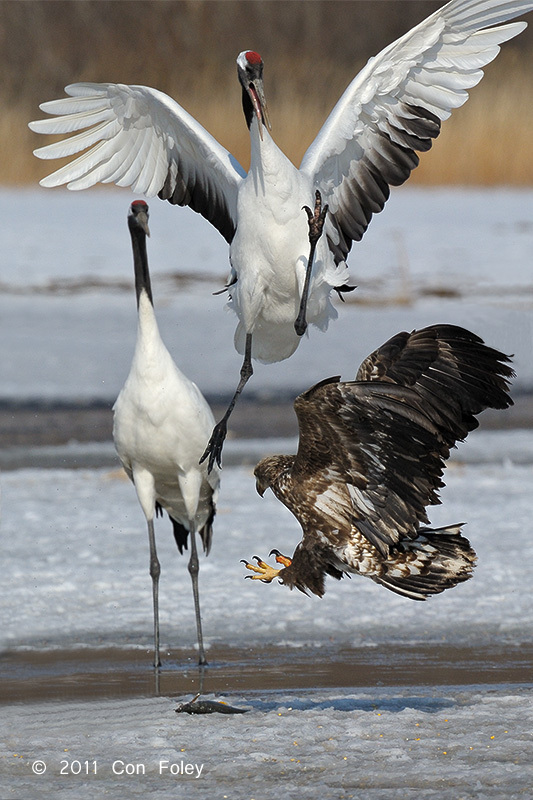 Is this still a good time to photograph Stella eagles and red head dancing cranes? I want to travel in February 2019 to Hokkaido for seeing and phtographing the cranes , eagles … What is the best period for observing cranes mating? For the eagles is it better bording a ship near Abashiri or Rausu? Hi Jean-Marie, not sure when it is best to see them mating, but in February they are starting to display which is possibly more interesting than mating. For the eagles, I only boarded a ship in Rausu, so I can not give you a comparison with Abashiri. Have a nice trip.